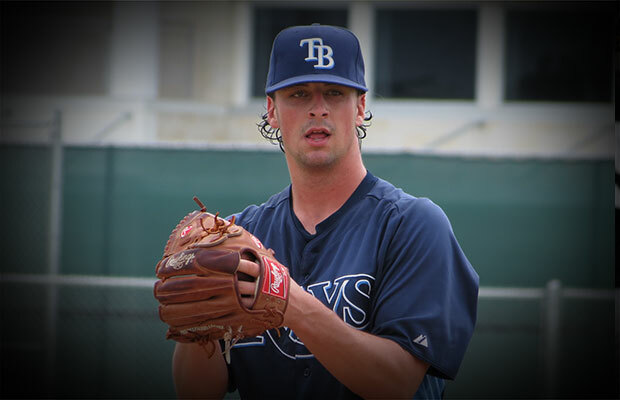 The top pitching prospect in the Tampa Bay Rays organization, Taylor Guerrieri, underwent Tommy John surgery today and will most likely be out until the 2015 season. Guerrieri was slated to pitch in the 2013 Futures Game, but was scratched due to fatigue, which appeared to follow him into his most recent start on July 15, where he was pulled in the third inning with elbow soreness. Guerrieri visited with Dr. James Andrews on Wednesday morning and the decision was made to have the surgery that afternoon, which was a reported success. The Rays’ top prospect came into his most recent start riding a four game stretch in which he tossed 22 scoreless innings, which he extended to over 24 before leaving the game. Guerrieri possesses good command and projects to be plus-level with further development. What sets apart Guerrieri from the majority of his prospect peers is his tremendous control, due in part to an easy delivery and plus pitch offerings. Guerrieri can throw strikes all day and can effectively locate each of his pitches to all parts of the plate, which has translated into very low walk rates. In 117.0 innings of professional baseball, Guerrieri has given up only 17 walks, an incredibly impressive statistic. He still has a very high ceiling and should bounce back from surgery in due time, in that the Rays have been quite patient with Guerrieri thus far and will take the necessary precautions in nursing him back to the mound.